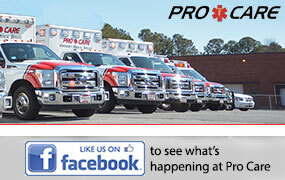 Pro Care's management team and its 100+ EMTs and paramedics are committed to providing superior pre-hospital and inter-facility care to our patients. Every one of our staff members is a professional EMT or paramedic and has been highly trained. We seek to provide care in the timeliest and most cost effective manner possible and, above all, we seek to treat our patients with respect and compassion. We understand that assisting those in a time of medical need is a tremendous responsibility and that's precisely why we are committed to excellence. Learn more about Pro Care's commitment to patient privacy.